Photos by Mike Yip (left) and Eric Demers with the VIU Bird Banding Project (right). The chestnut-backed chickadee is a small bird (to 12 cm long) bird with a large head and small bill. Its dark sooty-brown head contrasts strongly with its white cheeks. Its back is a rich chestnut brown - its sides are usually the same colour, though some populations have dull grey flanks. It has short rounded wings and a relatively long and narrow tail. The chestnut-backed chickadee's main call is easy to remember - it is a rapid chick-a-dee-dee, with a variable number of dee sounds. The call is often shortened to tsee-dee. 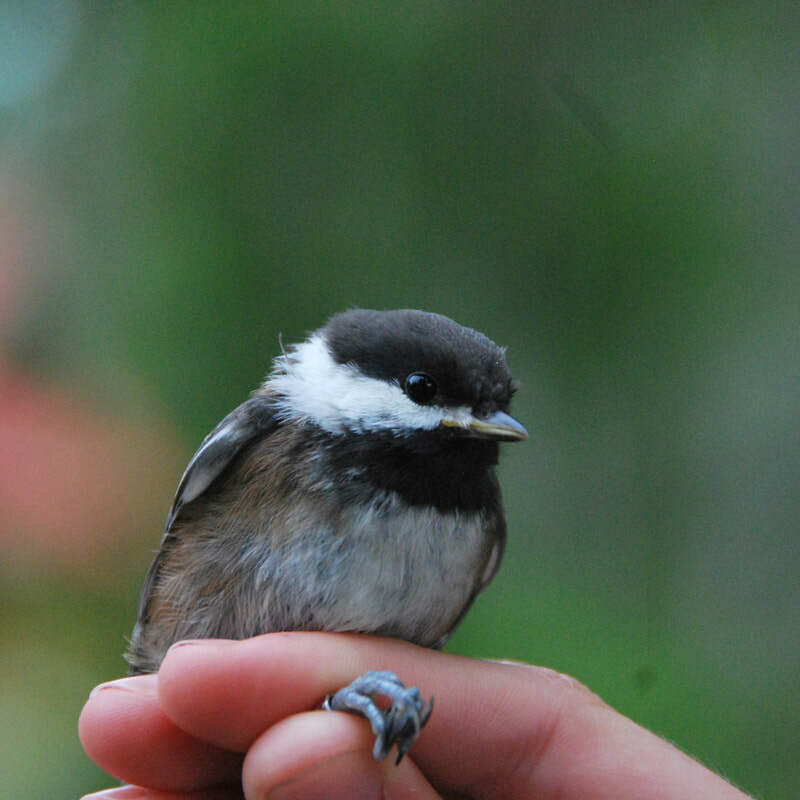 The chestnut-backed chickadee lives in dense coniferous forests as well as mixed forests and deciduous woodlands. It can also be found in shrubs, trees, parks, and backyards in suburbs, cities, and towns. Its year-round range extends along the coast from Alaska to California. 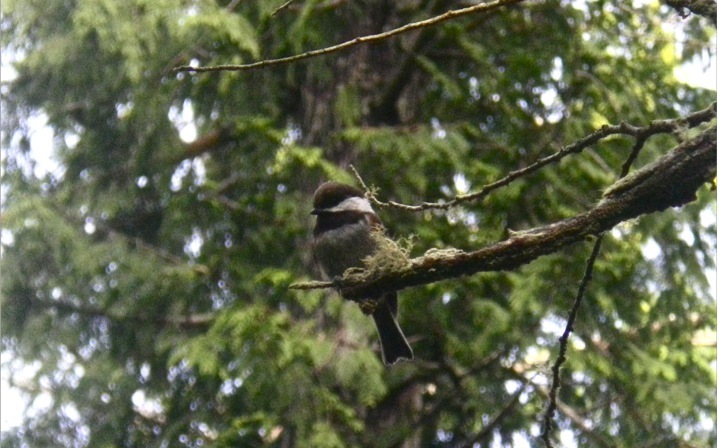 Other chickadee species are found in western North America, and some occur on the coasts of Alaska, Washington, and Oregon, but their ranges do not extend all the way to the BC coast. 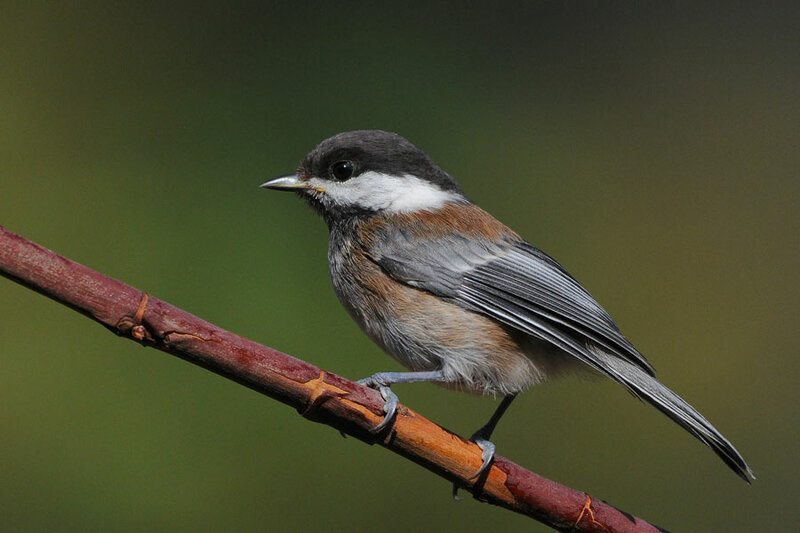 These species include the black-capped chickadee (Poecile atricapillus), the mountain chickadee (P. gambeli), and the boreal chickadee (P. hudsonicus). The chestnut-backed chickadee's rich brown back is a key distinguishing feature; the boreal chickadee has a brown but clearly not chestnut back, while the black-capped chickadee has buffy flanks and a grey back. The chestnut-backed chickadee's call is also shriller and faster than that of other chickadee species. Chestnut-backed Chickadee. The Birds of North America Online (A. Poole, Ed.). Ithaca: Cornell Lab of Ornithology. Retrieved from the Birds of North America Online. Accessed 09/10/2014. Chestnut-backed Chickadee Poecile rufescens. Audubon Birds. National Audubon Society. Accessed 09/10/2014. Dunn, J. L. and Alderfer, J. (Eds.). (2011). National Geographic Field Guide to the Birds of North America. (6th Ed.). Washington, D.C.: National Geographic Society. Pp. 378-379.